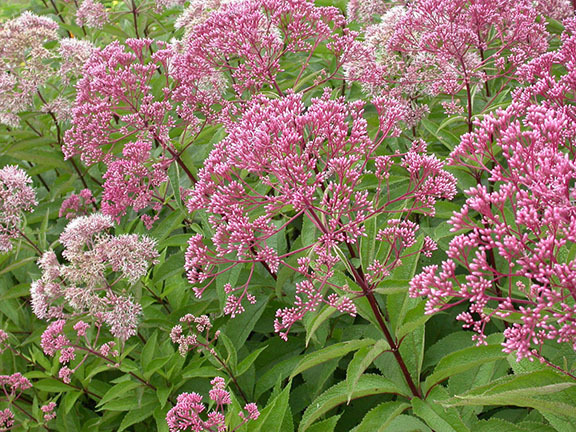 Eupatorium purpureum, commonly known as Joe-pye weed, is an attractive plant that produces pale pink-purple flowers that last from mid-summer through fall. It’s a great addition to nearly any garden and a must have for wildlife lovers, attracting a multitude of butterflies with its sweet nectar. The origin of the common name is uncertain. The most prevalent theory holds that it refers to a Colonial-era Native American named Joe Pye, who is said to have used one of the species to cure typhus. Another is that Joe Pye was a nineteenth-century white “Indian theme promoter” who used the root of one of the species to induce sweating in cases of typhus. The earliest use of this name dates to 1810–1820. In their native environment, these plants can be found in thickets and woodlands throughout the eastern half of North America. The plants are hardy from USDA Zones 4-9. They reach heights of anywhere between 3 and 12 feet, which creates great focal interest when using Joe-pye weeds in the garden. In addition, the flowers have a light vanilla fragrance that becomes more intense when crushed. Joe-pye weeds in the garden prefer full sun to partial shade. They also like to be kept somewhat moist in average to rich soil. It will tolerate wet soil conditions but not overly dry sites. Therefore, in areas with hot, dry summers, plant these ornamental beauties in partially shaded locales. 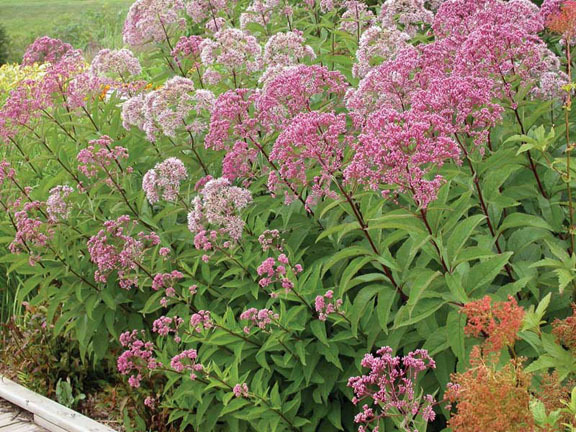 Spring or fall is the most suitable time to plant Joe-pye weed. Due to the height of which Joe-pye weed will grow, it makes a great background plant, but also needs plenty of room to grow. In fact, they are best planted on 24-inch (2 foot) centers as they will eventually form large clumps. 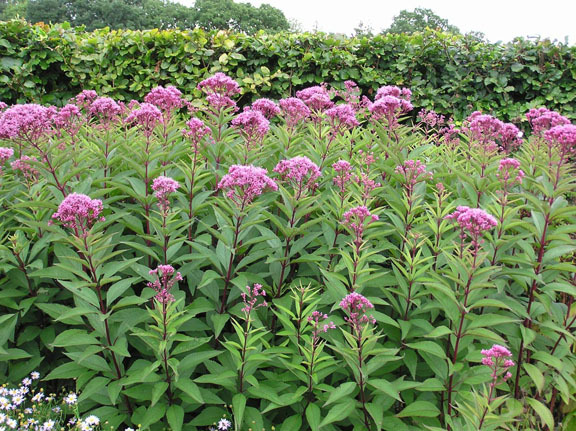 With its large flowers, Joe-Pye Weed can become top heavy and flop over. Planting it behind a sturdier plant for the support it is sometimes helpful. The height of the plant adds an architectural element to a billowy cottage style planting. Contrast it with golden Rudbeckia and goldenrod, for an instant autumn scene. There’s little maintenance involved with Joe-pye weed care. The plant does enjoy regular, deep watering and will withstand heat and drought fairly well when the soil is kept moist or shade is provided. A layer of mulch will help retain moisture levels too. Plants die back to the ground in late fall. This dead growth can be cut back or left over winter and cut in spring. Older plants can be divided and replanted in the early spring as new growth starts or also in the fall. When the center dies out of Joe-pye weeds in the garden, then it’s time for division. You need to dig up the entire clump, cutting away and discarding the dead center material. You can then replant the divided clumps. Root cuttings can also be taken in the spring. Joe-Pye Weed is not usually bothered by pests or diseases. The biggest problem is keeping it from getting dry. The leaf edges will scorch if the soil is allowed to remain dry for too long. Leaves may yellow if they receive too much strong sun. Damp areas and rainy seasons may cause some issues with snails, slugs, rust or leaf spot. The entire plant of Joe-Pye Weed is edible including the root. The leaves and stems can be harvested in the summer before the flower buds open and can be dried and stored for later use. The roots are harvested in the autumn. Fresh flowers can be used to make an herbal tea. When made into a tea, it has many health benefits. Its other name, gravel root was listed in the U.S. Pharmacopoeia from 1820 to 1842.